Printing quality is important but can be affected by very fine dust released from carton board during production. 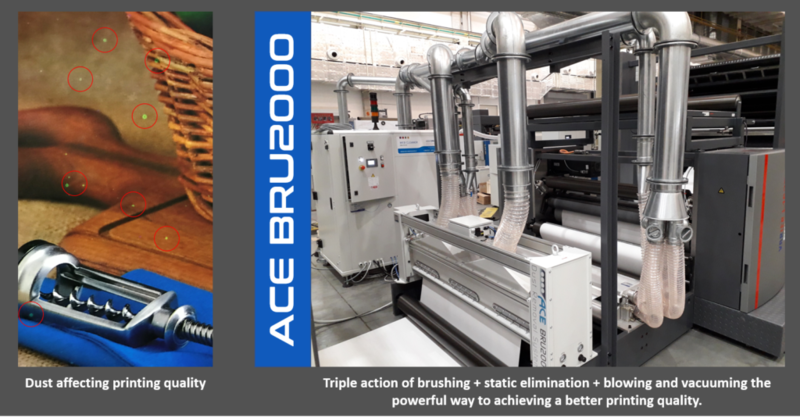 ACE launches on carton-board and paper converting market the new solution BRU2000. Whitening chemicals compounds are used to provide a better aspect to the paper. They are resulting in a very fine dust, which can hardly be completely removed by the traditional blowing/ vacuuming system. Printing quality suffers pretty much this condition in fact, these powders collect wet ink, dries along the printing process, then detaches from the media surfaces due to mechanical stress generating holes of colour in printing as shown above. BRU2000 is ACE’s answer to that problem. It is a stand-alone unit, inside is placed a special brush especially designed for extra-fine dust and longer fibers removal. The brush is lodged into a vacuuming chamber where a specific tool, cyclically removes the remaining of dust nestled in the bristles. BRU2000 is meant to work as a standalone module, or to be retrofitted to increasing the effectiveness of an existing blowing/vacuuming system. When offered as a new project instead, it will be coupled with ACE DM contactless dust removal system, giving life to the DM COMBI SOLUTION. So that the brush will lift up the long fibers and remove the fine powders, while the DM Cleaning Head will complete the dust removal. A big advantage of this configuration is the use of one only Filtering Unit SPB92, serving both the BRU2000 and the DM blowing/vacuuming Cleaning Head. Even in case of BRU2000 retrofitting. ACE’s expertise generates dedicated solutions for every production process.